Yesterday, Sunday, April 28, started out gorgeous! We woke to warm temperatures and blue skies after a week of clouds, cold winds, and heavy rain Friday & Saturday. I told Wanda we could not pass up a chance to ride on the first really nice weekend day since we got the trike. In the 2-1/2 weeks since we got the trike, Wanda & I had not ridden together more than a few miles to a local restaurant & back, or around town. That was going to change. Wanda is related to Moses Carver, the owner of former slave George Washington Carver, who grew up to become a famous botanist, educator & inventor. The Carver farm, now a national monument, is located near Diamond, Mo. and is about 50 miles away from our home. Wanda's 3x Great-grandfather was the brother of Moses Carver, and is buried in the family graveyard at the farm. Wanda had never been there, so that became our destination. We avoided the easy way down Interstate 49, choosing instead to ride to Joplin from Frontenac on hwy 171. We stopped at Woody's Smokehouse for lunch (good, Texas-style BBQ!) Woodies is the first thing you see riding into Joplin on hwy 171. After lunch, we made our way across town and headed south on Range Line at 32nd street. We passed under the construction mess where Range Line passes under Interstate 44 (reworking the intersection) and proceeded about a mile south to Reddings road, where we turned left. Just a short distance over, Reddings intersects with Saginaw road, which is old hwy 71 from Joplin to Neosho. Old 71 is narrow, twisty and slightly hilly. In other words, a biker's delight. It is also very scenic, running roughly parallel to Shoal creek and passing through some very pretty rural Missouri Ozarks countryside. A few miles down Old 71 was our intersection with county road V. V passed under the new Interstate 49 and was a straight shot east for another few miles of pretty countryside to the turnoff to GWC National Monument. I said it was a straight road, but I said nothing about flat! V hwy from I49 to the Carver Monument is one low hill after another. (It's the foothills of the Ozarks, folks.) Once at the Monument, we hiked out to the cemetery and Wanda took a few minutes to get acquainted with her ancestor. After we left and got back to where V hwy joined Old 71, instead of turning right and back toward Joplin, we went left and on south toward the tiny community of Tipton Ford. There's a unique restaurant there known as Undercliff Bar & Grill. The back wall of the restaurant is literally the stone face of a cliff! It's a destination for a lot of area bikers. We stopped in to have a soft drink on their outdoor covered patio - aka front porch. (there's also an open-air beer garden. We counted 20 motorcycles of various types in the parking lot; everything from Gold Wing & Harley trikes and full-dress tourers to Harley street cruisers, custom choppers and Japanese crotch rockets. There were even a few bicyclists mixed in. :D We were riding the only scooter! The Silver Wing trike generated a lot of interest, and it was apparently the first one most of the other riders had seen. After nearly an hour sitting on their front patio, sipping our drinks and watching motorcycles and people come and go, we took our own leave and headed back toward home. We stopped at a well-known local burger shack on the north end of Joplin for dinner. We were followed into the parking lot by four couples riding the big V-twin Honda cruisers. They immediately surrounded us where we parked! All was cool though, and the riders and their passengers (some very cute young ladies) sat at the table next to us while we enjoyed our burgers - and I enjoyed the view. We finished up the last thirty miles of the trip home and pulled the trike in the garage at 7:30 pm. What a great day! Congratulations on your first "real" ride. They will just keep on getting better and better. Nice report, and what better reason for a ride than a family connection. A few years ago I rode to a small village in southern England where my paternal ancestors lived from around 1600 (the time of Elizabeth I) to 1840. Standing by the font in the small church where they were all baptised was quite a moving experience. Saginaw … wasn't that a place mentioned in a song by a couple of popular music chappies in the 70's? It made me think of my first trip to the US (Detroit & Nashville) and seeing road signs to exotic sounding places known to Brits thought the influence of imported US culture (Kalamazoo, Chattanooga). All terribly exciting. I shall never forget landing at Detroit, waiting in the queue for immigration, where a very large lady in uniform was shouting “Aliens against the wall”! Think “Men in Black”! I digress … it's an age thing! I hope you enjoy many more miles, and tell us about them. Nice report Gyro. Thanks for taking us along. Glad you enjoyed the ride. Got to ask. What is Wanda wearing on her head? That's a snood (big fricking hair net.) Wanda's hair reaches below her knees, and without something to contain it, it would stream out behind her like a Patriot Rider's flag! ...Not to mention try to beat her to death. The snood is the only thing we've came up with that she can wear with a helmet. Gyro, you gave a great ride report, I wish I could spell and type with more than one finger. (well I sometimes use one from each hand) I would like to write a ride report from the rally I went to this weekend but it would take me all night to do it. Where do you bye a snood, and did she try on her helmet with the snood before she got her helmet? I put my ponytail under my vest. But when I go over 60 miles an hour it works it's way up and out the arm hole then it ends up in knots. I sometimes wear a helmet liner but on long rides it gets too tight and starts to hurt. That is even with a half helmet. He probably means the meat is burnt to a crisp! Real BBQ doesn't burn! It's cooked low and slow over indirect heat and smoke from a wood fire. You're thinking about grilling. That ain't BBQ! Just go to Amazon.com and type "snood" in the search box. You will get dozens of choices. She got the half-helmet first, and it stiull fits. I do want to measure and have her try on some full-face helmets while wearing her snood before we buy her one. Great report. I bet you two had fun and it seems everyone who trikes their SWing out likes it. I bet you get alot of riding in this year. You should keep track of your mileage for a year-end report. Not that it matters too much but what kind of mpg's are you getting with this? I avg from 48-52 depending on my riding. Or low 40's if i'm open throttle alot. Well, the owner claims to be from Texas...[/quote] A lot of people claim to be from Texas. Who can blame 'em? Wonder if I can get a Snood here in Oz? My hair is down to my waist and the only thing I can do without getting it knotted up on a ride is to plait my tail, just having it in a pony tail doesnt surfice. Sounds like you and Wanda had a fantastic time. Trishc, I typed in "snood in Australia" on a search engine and got about 200 results. You should be able to find what you need. Yes I have a life. Now back to Gyro's fabulous ride. After riding 1k kl on my new Trigg trike,all I can say is I should have trike d years ago.Riding over pot holes and uneven roads has reduce the shock impact by 1/2 du to the position of the trike wheels set back 6" from the rear driving wheel .Cross winds and transport trucks don't steer you off corse .There is no pulling to the side at HWY speeds and going into a corner take minimal effort when following recommended HWY speed .Being a 48" trike kite you don't realize you riding a trike .In the city it nimble and quick to respond and is better then handling a big cruiser in heavy traffic. The response I get from kids is that's cool,and sick,and the older persons like how slim it look compare to other trikes on the road .Anyway am aiming to ride another 25k kl this year . PS my DD tire on the front will take longer to wear out. Thanks for that link! I'll show that to Wanda this evening when she gets home. Maybe she'll want to try it. Tinman wouldnt it be a 1k klm ride one way to get to the nearest city? Tinman, is it difficult to backup, turn around in reverse? Hotwings most of the towns are about 50 miles from my location including the Quebec border 100 kl away,a complete turn around in a straight line is 160 kl,and 600 to 700 kl the scenic route. Disturbed , with my 26" inseam I have no problem on my Trigg kit and to push it in my garage my hand can stop my Swing on a dime .The good thing if you look at my album I have a up grade drive way ,and from on my swing gravity rolls my scoot into my small garage without stoping .Once inside I use the parking brakes because my floor leans to the back ,then I guide it to the back to park my Tracker for the night. I have 3k kl on my trigg trike ,and have no regrets on buying this kit.Most of the time I don't notice that that i am riding with a trike. My HWY speeds are at the speed limits give or take 10 klph.At those speeds it is very good.It takes 15 minutes to remove and to install and the alinement stays true and no adjustment needed To day I installed a new drive belt and Dr Pulley 24 gram sliders , and it took 3 hrs from start to finish , others would have done it in half the time,I like to take my time and check thing out.I never thought that I would like riding my trike so much and I change my mined about riding on 2 wheels , That part of riding style is over for me ,I wont be falling any more. That's what it's all about. Enjoying the ride and feeling more secure than when on two wheels. The trike haters forget (or don't realize) that the ride experience on a trike is, for the most part, identical to that on a two-wheeler. The exception being in the fast turns, of course. My view of the road, and my experiences of the road (wind, sounds, feelings of vibration through the handlebars, etc.) from the rider position on my Silver Wing trike are essentially the same as someone on a 2-wheel S'wing. Before the Grinchy types step in and shout "How do you know? You don't have a 2-wheeled S'wing!" Please tell me how it would be different. LUV my SW w/Danson Trike. Haven't been on 'long' rides,' yet. Getting around 42-44 mpg in my travels on suburban type roads. I am approaching 5k kl on my Trigg trike and have been getting 60 to 62 mpg ( Imperial gallons) the best 64 mpg .I have been adjusting the pre load and found that adjusting the pre load with a 3/4 " plywood on the driving wheel was way to much causing rear wheel spin on a bit of sand on the road.Now I removed the plywood a set the suspension to 5 , lined up the torsion bars to neutral then adjusted the torsion bars to the point where 50 lbs tork setting wood sin the trike tire when applied to the wheel nuts .I had to adjust it that way after installing Pr Pulley 24 gram sliders and the extra grunt that they gave on takeoff .Altho squealing tires from a stand still made it cool. Yes, the Danson kit utilizes the foot-o-matic reverse gear technology. Why is it called a trike kit when it has four wheels? Shouldnt it be called a quad kit? It's called a trike because it leaves three tracks in sand or snow. If it were a quad it would leave either two or four (Isetta) tracks. BTW, Danson is a VERY Good product. ?? If i get a "trike" kit the swing becomes a snowmobile then? ?what if im turning and i leave four tracks am i at that moment riding a quad? Err... Don't you all put your scooters away at the end of "the riding season" before there's a chance of any snow to make tracks in. Out of interest which of the 4 wheels is not in contact with the road when you're going in a straight line? Call it what you like mine is known and sold as a trike kit,and yes for the Trigg kit ,A electric reverse is and optional installation but better suited for the GW,and big heavy cruisers. When it comes to stop riding 2 wheels or triking your ride to keep enjoying the ride ,it's a no brainer for me and many more to trike there rides.Some day that could be your option to trike or stop riding and watch others go by. Had I not discovered the maxi-scooters and the trike conversions for them, I would still be one of those sitting on the side and watching others go by. The Can-Am Spyders, Gold Wing & Harley trikes, etc. are completely out of my budget, and two wheels are not an option. With my trike I've regained some of the freedom and mobility I've lost over the last several years. For those who don't like trikes - stuff it! Perhaps it's time for a trike section similar to the Darkside Car Tire section. Somewhere that those who owned or wanted to know about the various trike kits could discuss the pros and cons without having to be insulted by others. I may have to give up two wheels in my near future. I hope to save up enough to bye a Yelvington trike kit (hay it's cheaper than two new hips) but if I can't I will get whatever kit I can afford at the time. There are a few good kits out there as Gyro, tinman, Homer and others seem happy with their choices. I have even seen plans on how to make a trike using a small trailer from Home Depot or Harbor Freight. But my point is we all have to do what we need to continue to ride and should be able to discuss it without ridicule. Wouldn't it be simpler for the Moderators to "have a word or two" with those who feel the need to insult and belittle others who do not fit their narrow definitions of a proper scooter or scooter rider instead of going to the effort to set up a separate forum? I came to this forum because it's about the Honda Silver Wing. Nowhere did I read that it was restricted to only two-wheeled Silver Wings ridden only in the proper manner and fitted with "approved" accessories and modifications. Fortunately, the majority of people on this site have been remarkably friendly, helpful and welcoming. It'll take more than a couple of cantankerous old buggers to chase me off, and I don't feel I should have to hide in a "secret" trikes-only forum. Being in the majority of aging motorcycle riders with increasing joint and mobility pains ,it only a matter of time before the young buck's join in the ranks of I am so sore i cant even piss, and decide if they are will to give up riding forever,or chose to ride with extra stability and to keep enjoying what we all want to do. I ride more miles in the short season that I have 25k kl or more in 5 month. Most of the guys I ride with will take 3 years or more to ride that much. The more information that one get on different trike kit out there ,the better you can decide on witch way to go. Having a separate trike section (maybe even trailer section too) could be very useful for members new and old, or converts, looking for specific trike/trailer information. Everything related in one place; not hidden or requiring special posting rights (if I may be so bold). If admin could spare the time, perhaps all previous related posts could be moved to create a database. It could attract new members using search engines in their quest for info. Having a separate trike section (maybe even trailer section too) could be very useful for members new and old, or converts, looking for specific trike/trailer information. Everything related in one place; not hidden or requiring special posting rights (if I may be so bold). If admin could spare the time, perhaps all previous related posts could be moved to create a database. It could attract new members using search engines in their quest for info. Is that really necessary? Simply typing "trike" into the search feature turns up 41 threads about trikes. Same for "trailer" turns up 21 threads. A separate forum does not address the issue of opinionated a** wipes spouting off about things they dislike, or spewing snide, insulting remarks about others and their riding lifestyles or equipment choices. You're on a forum mate, so expect your views to be challenged at times. Have a go at the post not the poster, the message not the messenger, and the story not the storyteller. You're the one getting that red hankie in a twist over nothing and resorting to petty name calling. You've recently used words like prigs, curmudgeons, buggers, and in your latest rant a**wipes. Has anyone actually directed similar words at you? I don't believe that calling for the Moderators to "have a word" on your behalf is doing you any favours either. There's an American saying about calling a spade a spade. And a great English playwright said something about "a rose, by any other name..."
Hey, I just though it might serve a useful purpose to group similar threads under one heading than have to do a search. All forums (including this one) are sub-divided to some degree or other. Easier to do it now, whilst there are relatively few posts, than to suddenly think about it a year from now when (hopefully) there are hundreds. On another bike specific forum (of which I'm an admin) we begrudgingly started a new section for "other bikes". It grew. That section now has a dozen or so sub-sections, each for a specific "other" bike. New members now join JUST for the info contained therein. I'll happily accept anything the moderators decide to do, but I'll be very disappointed if it were made a restricted forum like the Darkside Tire forum. I think it is simply ridiculous that people cannot simply let others do their own thing to the point that it became necessary to make a closed forum. I wasn't here when the Darkside forum was created, but I can imagine that a lot of vitriol was traded, forcing the need for it. I'll be very disappointed if it were made a restricted forum like the Darkside Tire forum. Just organised for the benefit of ALL readers. NOT to sideline anyone. Just for the record, I have a biking chum (known to others here) who has had to give up all riding, due physical ill health. He simply can't ride. 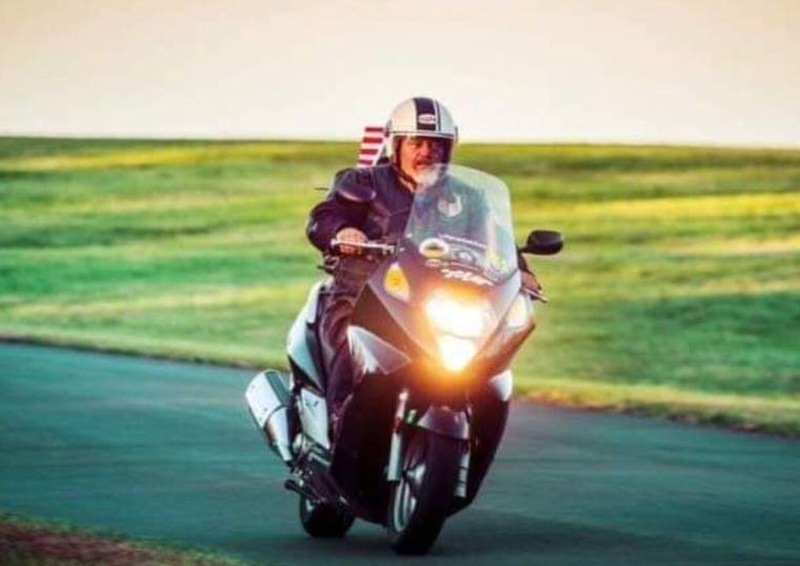 On the positive side, he remains very active in the field, being involved in the charity, National Association for Bikers with a Disability (NABD). Good on yer Del Boy. Geez. enough already! I liked this forum because it dealt with the Honda Silver Wing .... be it on two wheels or with a conversion kit to make it a 'trike'. Yes a Danson kit really turns it into having 4 wheels on the ground -- 1 steering, 1 drive, and two 'outriggers' to go along for the ride. Maybe that makes the SW not a "true trike," but it sure makes having those extra wheels nice (especially for an old codger (73 yrs old) like me.